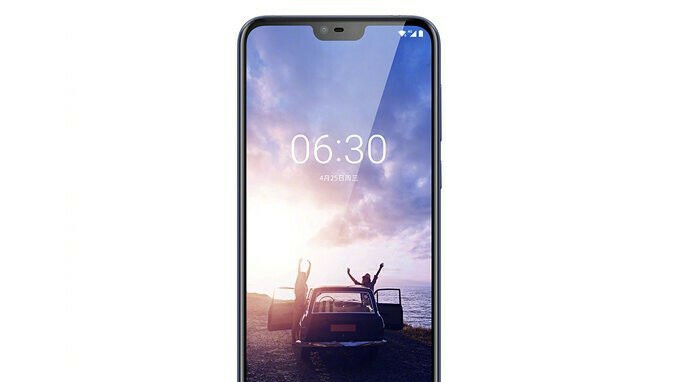 The Nokia X6 has appeared yet again, this time in a promotional poster that confirms its design once again. Despite previous rumors pointing towards an April 27 announcement, HMD Global finally confirmed that its first notch-equipped smartphone would be unveiled May 16. Now, with just 9 days to go, a Chinese retailer has revealed a promotional poster for the device that includes official renders. The poster, which appears to have been created by the retailer, gives customers a pretty good look at the upcoming Nokia device. As can be seen in the renders, the Nokia X6 will boast a glass and aluminum build, as is becoming the norm in the industry, with the front panel perhaps being the differentiating design choice. After all, it boasts a tall 5.8-inch, 19;9 display that includes a small notch up top and a slight chin underneath. In addition, thin bezels on either side can also be spotted. Regarding the rear, however, the smartphone looks similar to a number of recent Nokia devices, with the company’s signature tube-like vertical camera setup and a circular fingerprint reader both being included. Specifications-wise, HMD Global is set to include Qualcomm’s Snapdragon 636 on the inside of the handset alongside a very respectable 6GB of RAM. Alternatively, the company is rumored to be preparing a 4GB of RAM model with a MediaTek P60 processor. Suning, which is the retailer in question, is currently holding a photography competition that concludes on May 20. As part of the prizes, the 10 favorites will receive a new Nokia X6 unit, while a further three will receive a cash prize. It’s unclear why the retailer has chosen May 20 as the end date but, considering that smartphone is set to be unveiled just a few days prior, it’s possible that this could be the release date of HMD Global’s latest device in China. Man, shut up. You people are behaving like Huawei invented the whole notch thing. With new aspect ratio and notch design pretty much all the phone will look the same. Exactly, they should stop using notches. when exactly will Nokia launch a flagship .penta lens setup????? In the autumn. And it’s HMD Global, not Nokia. If I'm not mistaken, HMD hired some former Nokia employees so they can be considered Nokia in spirit. They'll release when it's too late and nobody cares. Quite frankly I'm tired of seeing all these mid-range phone from Nokia/HMD. They should've been at the forefront of a 2018 40mp smartphone camera but they let Huawei do it(which I think they did an admirable job). But I would much more prefer them to reimagine the Lumia 1020 with today's horsepower and technology and lead the charge for smartphone photography. How many photos are they going to crank out? I'm quite puzzled as to what their main flagship is, if they have one. What are they targeting? When are they going to release one with top of the line specs? I wouldn't mind a Pixel made by HMD. Very nice looking smartphone. HMD’s strategy of banging out Nokia branded smartphones for all segments is paying off for them. They even increased their standing globally in the smartphone market for Q1 2018:https://nokiapoweruser.com/report-nokia-brand-improves-smartphone-vendor-ranking-market-share-in-q1-2018/ This is a similar strategy that worked well for the Nokia of old. Keep up the good work, HMD/Nokia. Why delete your response to me? Didn’t want everyone to see how bothered you were by me posting facts? What makes you think I was even responding to you? But thank you for confirming that you were trying to throw shade yet again. The fact that your comment is literally under mine and curved off to the side, like responses to comments show up on PA, that’s what. But thanks for trying to prove otherwise, only to give me the opportunity to hit you with the facts again. You clearly had seconds thoughts about whatever slick retort you had, knowing that I’d just run you off, as usual. Or maybe I was responding to someone else and just happened to accidentally hit the wrong button and ended up responding to you. You and your self-aggrandizing attitude. LMAO! The lies you tell never cease to amaze me. You lie so much that you actually believe what you type. If you look down at comment 13 you will see that I did in fact post a response to his comment. So what's that thing you said before, pot meet kettle? With Snapdragon 636 and a 3500 mAh battery, this could end up being a great battery life performer - and my next phone. Unfortunately it may or may not be the best performing device if you are a heavy user. It definitely will be a great battery performer, as well as a great overall performer. It definitely will not be as good as something that has a flagship SoC chip and that is a fact. Battery life will probably be good. It will definitely be a great performer against other smartphones in its class, and that’s a fact. NO ONE would put an upper mid-ranger against a flagship. It doesn’t make any sense. Those that do are being utterly ridiculously and petty. It will definitely be an ok performer but not as good as others due to the specs. It makes sense to compare when you have this available: https://www.phonearena.com/news/Google-pixel-xl-deal-discount-refurbished_id104820 So no ridiculousness or petty nonsense at all. No, it doesn’t make sense to compare a +700 dollar smartphone to a sub-$300 one. That’s most assuredly ridiculous and petty, no matter what discount it may have. Yet you recently did it yourself. Stop being a hypocrite. It's only petty because you can't get over the fact that the Pixel is just the overall better device. Cry less please. I hope this kind of specs will be there in global version or in the next year version of Nokia 6 aka 6.2 or 6 (2019). My first phone is Nokia,I miss it.